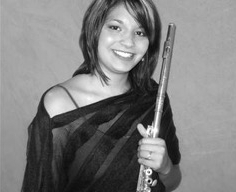 Liz Trinidad earned her bachelor’s degree from the Conservatory of Music in Puerto Rico where she earned her Bachelor’s Degree in flute performance. In 2005 she was awarded 3rd prize of the concerto competition as well as a substitute position with the Puerto Rico Symphony Orchestra where she had the opportunity to play many of the greatest orchestral masterpieces under world-renowned conductors. Among Liz Trinidad flute teachers are Mr. Randolph Bowman, Principal Flutist of the Cincinnati Symphony Orchestra, Linda Toote and Sheryl Cohen, former principal flute of the Tuscaloosa Symphony Orchestra. Liz has participated in master classes with Amy Porter, Jim Walker, Lisa Ruoho, Paul Edmund Davies, Amy Likar, Keith Underwood, Carol Winsenc and Mary Karen Clardy. In the summer of 2011, she participated in Trevor Wye’s master class “Preparing for Employment” where she had an opportunity to work extensively with this world-class flutist. Mrs Trinidad has performed in the Carnigie Hall as part of the New York Wind Band Festival with the Puerto Rico Conservatory’s Wind Ensemble. She also had the opportunity to perform at the Boston Symphony Hall with the Boston University Symphony Orchestra. In addition, she has participated in several recordings with the Boston University’s Wind Ensemble and substituted with the U.S. Coast Guard Premier Service Band. Now a graduate, she is actively engaged as a freelancer and private flute instructor in the New England area.